Thanks to my meeting Janet Beech at some patchwork event, I was invited to submit items for the Chester P’s & Q’s Exhibition at Chester Cathedral in 1986. I joined the Quilters’ Guild on the day we visited and was warmly welcomed. That autumn I attended my first Regional Day at Guilden Sutton, run by Val Neve. There I met the lady alongside whose work my two Margaret Rolfe cushions had been displayed – Maureen Hoyle from Lymm. Seated between us was Pat Simmonds from Timperley (now in Bath) and our conversation over the lunchtime butties gave us the idea of a group to encourage quilting in Sale. I knew Carolyn Whiteley well, who already had a flourishing housegroup, so ten of us met in May 1987 at Sale United Reformed Church to see how we might proceed, on a monthly basis. Only six turned up the second month, and we couldn’t pay the rent! We went to each others’ homes, until 16 of us were vying for light, sockets, cutting-space (did we have cutting boards then?! ), iron-space – it was time to move back to the church on Montague Road – hence the name of the group! We quite quickly became a band of about 25 ladies, with varying skills and abilities, but full of enthusiasm. Carolyn had “served her apprenticeship” in America, where she’d made a sampler quilt. Her sharing of “know-how” widened our scope considerably. 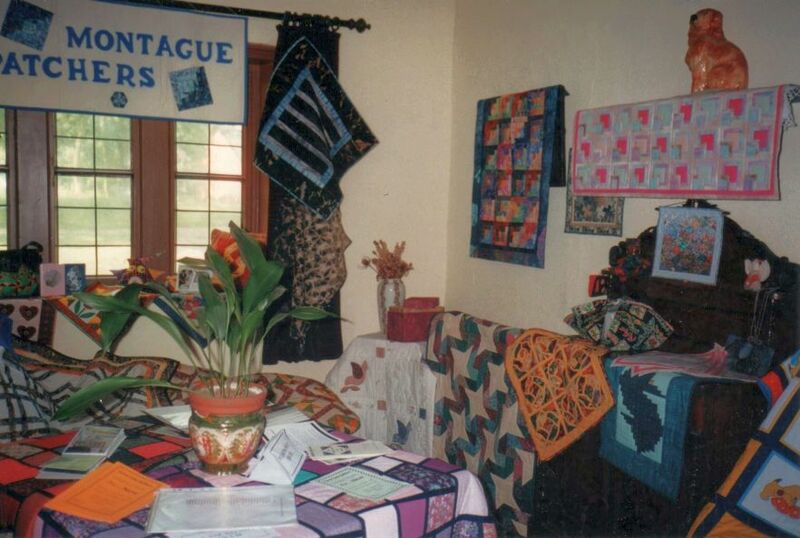 She, among several others, had by this time joined the Quilters’ Guild too, so we availed ourselves of workshops, talks, meetings and exhibitions. One workshop was a Bernie Barmby Christmas workshop in 1989, closely followed by one on Celtic appliqué – we felt we knew Bernie well enough to invite her to do ‘bargello’ with us, and we had a great day – the first of many visiting tutors! 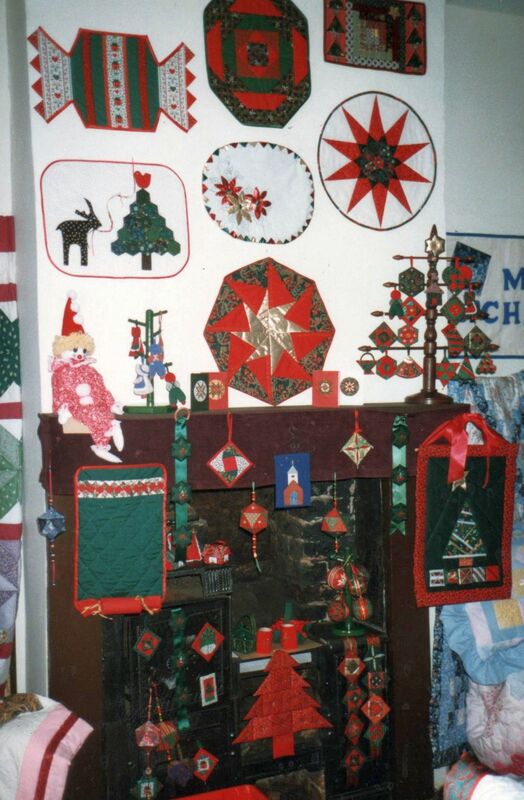 Maureen Hoyle of course shared “in-house” with her miniature patchwork and her super Christmas decorations. We miss her enthusiasm, but remember her each Christmas, when the Viewers’ Choice winner of the Chairman’s Challenge takes home one of Maureen’s little hexagon hangings for a year. Many others in the group have developed skills and ideas to share as well. We have held several ‘open evenings’ every year and have enjoyed coach trips to Exhibitions further afield. We began to think about holding our own exhibition and making a quilt to raffle. Mary Ramby, then Regional Organiser, gave us great encouragement when we held our first big event on February 29th. 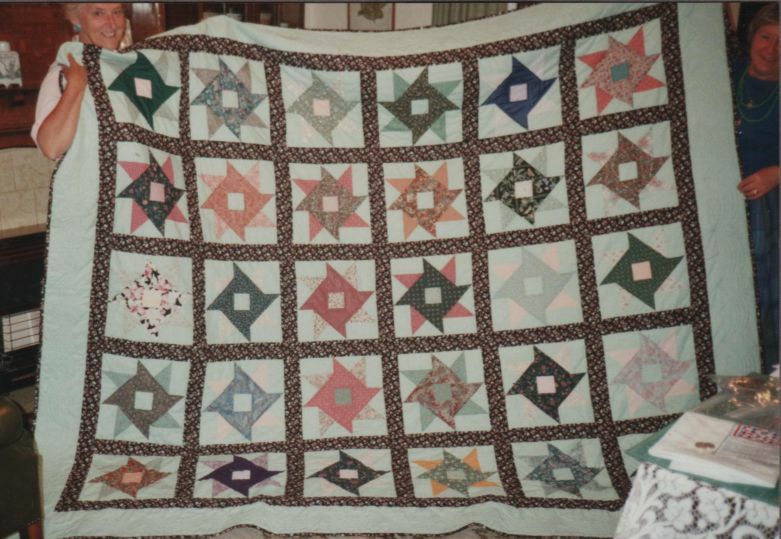 1991 – a special leap-year OXFAM day – with our first group quilt, a whirling star block, raising money for Francis House, the Rainbow Family Trust’s hospice for children. I think we had over 50 cushions on show! Margaret and Carolyn proudly displaying the groups first quilt. After our second exhibition two years later, numbers had outgrown the Church lounge and a move was made to the Salvation Army Hall in Sale. A large banner was made for their worship space, and we undertook the refurbishment of their canal boat’s curtains and cushion covers. That included a working-day at the Salvation Army, where they fed us right royally!! Three wall-hangings were made for Trafford General Hospital’s Outpatient Department and two raffle quilts are made for our biennial exhibitions – two, because there is an afternoon meeting still at the Church as well as the evening one at the Salvation Army. 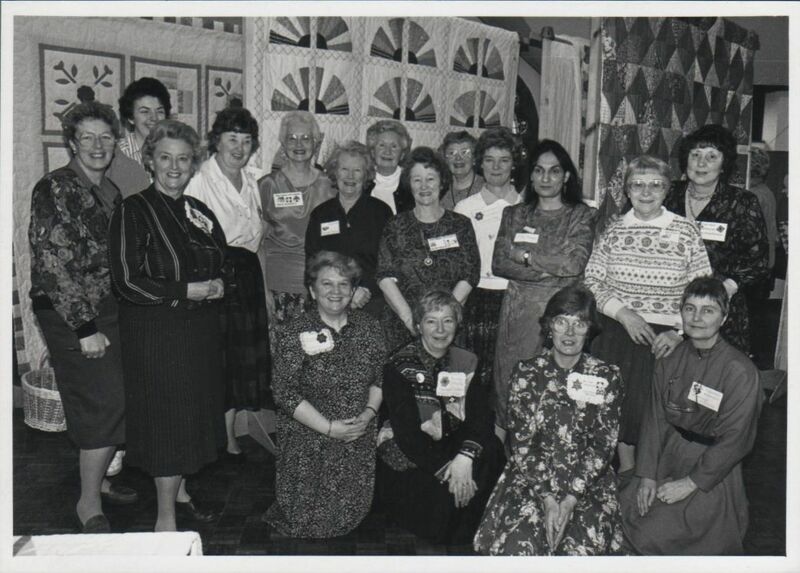 Montague Patchers enjoyed the camaraderie of the summer meetings – The Women’s Touch -at Tatton Old Hall from 1993. We made many friends there. Several of us took part in providing mini-workshops at an event at the National Museum of Labour History in 1994. This followed on from Regional Organiser Claire Nicholson’s very successful event celebrating the Well Woman Centre in Preston. – Remember the Shoe Quilt. Carolyn Whiteley became our Area Organiser for East Cheshire and South Manchester in 1993. We have also provided two editors (so far!) of our Regional 13 Newsletter in Linda Bilsborrow and Christine Walton. Several members have won awards at the major exhibitions. More recently we have made seasonal pulpit falls and table runners for the Church where we first met, and Linus Project and Quilts for Injured Servicemen at Headley Court have really touched the generosity of many members. And if you have been to a workshop, a Desert Island Day or our Exhibitions you will know Montague Patchers aim to provide home-made fare to the highest standard! – If you haven’t found out for yourself, do come and visit us! Our 25th.Anniversary Exhibition will be on February 17th. and 18th. 2012! You will be very welcome!